Fresh back from extensive engine repairs Sunday provided a good opportunity for ‘testing’ the clubs osprey RIB, Sea Eagle. The weather forecast was not particularly promising but fortunately turned out better than predicted. 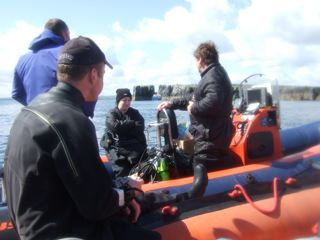 Sea Eagle was duly launched from Seahouses and engine firing on all cylinders headed out towards Staple Island to rendezvous with Dave Taylor’s RIB and his team of budding AI and First class diving candidates. 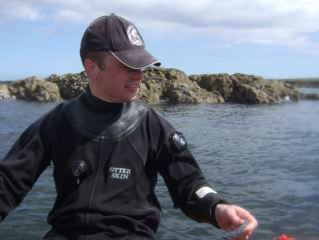 First dive was on the wreck site of the SS St Andrea. Dropping down the shot line it was soon clear that this area of the coastline had also suffered from the recent plankton bloom, restricting the underwater visibility to just a few metres at best. Nevertheless, the St Andrea provided an interesting if rather gloomy dive. Once all of the party was safely recovered, Sea Eagle headed around the island to a small reef known as Gun Rocks. 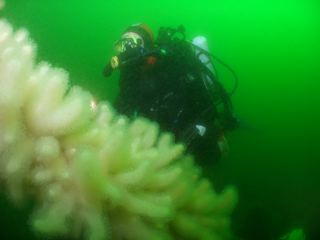 This part of the Farnes has a historic association with Tyneside branch as back in the early 1970’s the club was involved in a major project surveying and excavating the old wreck of a mysterious sailing vessel that met its end on this isolated reef. 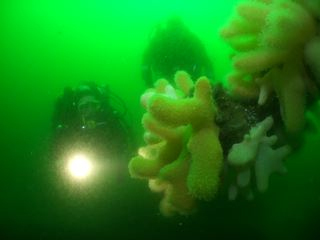 Perhaps not surprisingly the reef takes its name from old cannon that at one time littered this site. Nearly 40 years on since the club fist dived this site, Andy Hunt and Richard Booth dived Gun Rocks again to conduct a brief recce of the site with a view to looking at the viability of organising a branch project for 2010 to celebrate the 40th anniversary of the Gun Rocks project. 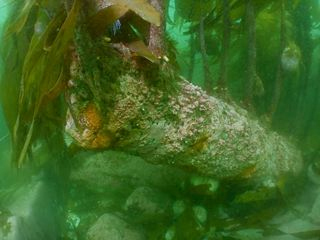 This dive quickly revealed a site that is now well covered by kelp and concealing any remaining archaeological artefacts. However, after a careful search four old cannon’s were eventually located. A successful end to the days diving, with the bonus of an engine that performed faultlessly.